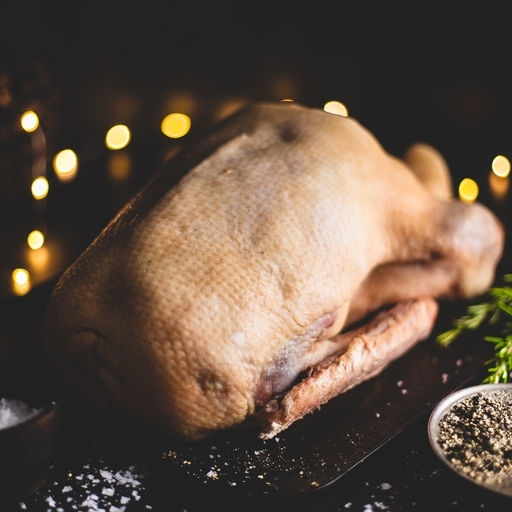 Roast goose – the traditional festive centrepiece. Our show-stopping organic free-range birds are rich in flavour, with juicy meat and crisp skin. We include the giblets so you can make the absolute best proper gravy, and plenty of goose fat for crunchy golden roasties. Serves 4-5, minimum weight 5kg. Find more organic Christmas meat in our online shop. 2-3 hours before cooking, lightly prick the skin over the breast and season generously with salt and pepper. Preheat the oven, cover the goose with foil and roast for 30 mins at 220°C/Gas 7. Remove the foil, baste with the fat and reduce the heat to 180°C/Gas 4. Put the goose on a wire rack in a roasting tin. Roast for 30 mins per kilo, basting half way through. If the skin looks as if it may be starting to burn, cover with foil again towards the end of cooking. To check the bird is cooked, insert a sharp knife into the thickest part of the leg where it joins the breast; the juices should run clear. Keep in the fridge below 5˚C. If you’re not going to eat it within a day or two, freeze your meat as soon as possible and always within the use by date. Once frozen, use within a month. Use on the day of defrosting. Minimum use by date 26th December. Ross Gardner rears our geese at Otter Valley Farm in Devon. His family has been farming poultry for 45 years, so they certainly know how to keep their birds happy. The geese pad around the fields in a small flock and graze the organic pasture, as well as getting a little supplementary organic feed. They are determined foragers and have plenty of outdoor space to express their natural behavior. At night, they prefer to head inside their straw-filled barn.